Indie authors are outselling the Big Five. That’s the entire Big Five. Combined…in the most popular and bestselling genres on Amazon. Indie authors are earning nearly half the total author revenue from [leading] genre fiction sales on Amazon. For the top-selling genres, Amazon is currently making nearly as much profit from indie ebooks as from Big Five ebooks. For Big Five-published works [in the top-selling genres] the publisher makes more than twice what the author makes for the sale of an ebook. What you’re reading above are, first, several top-line assertions I’ve excerpted from a report on an all-new set of calculations. They lie at the heart of a new website and author-advocacy effort, AuthorEarnings.com. On Twitter, it’s @AuthorEarnings. Second, you’re reading comments made to me by Hugh Howey shortly after the report on those calculations went live on the Author Earnings site. The points I’ve culled from the report are not independently verified results, and the report is titled just that, The Report. It has a February 12 date on it but it was made visible during the afternoon Tuesday, February 11, by its authors, Howey and an unnamed associate who is working on this project with him. The site was temporarily crashed Tuesday shortly after the report went live by high levels of traffic, Howey confirmed to me. Author Joe Konrath posted a copy of The Report at his own site, with commentary, during the AuthorEarnings.com outage. The tweeterie was quickly bustling with authors telling each other about it. Buzz and debate are likely to grow all evening and into Wednesday. @Woelf20 @authorearnings Both a revelation and a confirmation. The self-publishing shadow industry is now out of the shadows. There are five activities offered by the new site. You can sign up for email from Author Earnings. You can download an Excel spreadsheet with the data on which the report is based. The austerity of the site, the concision and economy of its statements, may surprise some in the established publishing community who would expect any effort in organizing entrepreneurial authors to be all funny hats, whimsical fonts, motivational aphorisms, and phantom unicorn lovers. Not so. There are no faeries at the bottom of this garden. This looks serious. “I hope to start a dialog,” Howey tells me, “about what’s really happening in the publishing world rather than talk about what we hope might be happening. “Seeing reports on the flattening of book sales, penetration rates of 25% for e-books, and comparisons between all of self-publishing and only the top 1% (or less) of traditional publishing is doing real harm for writers,” he says. “The real story is visible in the trenches, at writing conferences, in forums, in private Facebook groups. Better data will support that picture. I’ve always suspected this. Here are some more of the data points being generated by the report that Howey and his associate are making at Author Earnings. Again, I’ve excerpted them, and the calculations that produce them have been made, Howey says, on three leading genres: mystery/thriller/suspense; science fiction/fantasy; and romance. Indie and small-publisher titles dominate the bestselling genres on Amazon. 86% of the Top-2,500 genre fiction bestsellers in the overall Amazon store are ebooks. 92% of the Top-100 bestselling books are ebooks. More self-published authors are, on average, earning more money on fewer books [than are traditionally published authors]. This first snapshot of estimates based on information found at Amazon.com comprises a look at 7,000 genre titles. Already, another round of calculations is being processed, Howey says. Howey tells me that he’s not alone in his pursuit of data and analysis of it. “Authors who hope to make a living at this, are on the verge of making a living at this, or who already are making a living at this,” he says, “are very keen for as much data as possible. I had charted my daily sales reports as my works marched from outside the top one million right up to #1 on Amazon. Using these snapshots, I could plot the correlation between rankings and sales. It wasn’t long before dozens of self-published authors were sharing their sales rates at various positions along the lists in order to make author earnings more transparent to others [link] [link]. Gradually, it became possible to closely estimate how much an author was earning simply by looking at where their works ranked on public lists [link]. I received an email from an author with advanced coding skills who had created a software program that can crawl online bestseller lists and grab mountains of data. All of this data is public—it’s online for anyone to see—but until now it’s been extremely difficult to gather, aggregate, and organize. This program, however, is able to do in a day what would take hundreds of volunteers with web browsers and pencils a week to accomplish. The first run grabbed data on nearly 7,000 e-books from several bestselling genre categories on Amazon. Subsequent runs have looked at data for 50,000 titles across all genres. You can ask this data some pretty amazing questions, questions I’ve been asking for well over a year [link]. And now we finally have some answers. Those answers offer some intriguing observations. The report is imminently readable and even those who may have been put off in the past by shrill and hostile rhetoric from the self-publishing wing of the authors’ corps will find that Howey writes without anger. If you tuned out the voices of the entrepreneurial author community because you once found them vengeful and sneering, it’s time you started listening again. Howey writes with an earnest, personable, light touch. Other artistic endeavors have far greater data at hand, and practitioners of those arts and those who aspire to follow in their footsteps are able to make better-informed decisions. The expectations of these artists and athletes are couched in realism to a degree that the writing profession does not currently enjoy. In trying to begin remedying that dearth of information, Howey and his associate compared average review ratings with average pricing on those bestselling ebooks. Is it possible that price impacts a book’s rating? Most readers don’t know and don’t care how the books they read are published. They just know if they liked the story and how much they paid. If they’re paying twice as much for traditionally published books, which experience will they rate higher? The one with better bang for the buck…Are publishers losing money in the long run by charging higher prices? Are they decreasing the value/cost ratio and thereby creating lower average ratings for their authors and their products? Choosing which way to publish is becoming a difficult choice for the modern author. This choice has only grown more challenging as options have expanded and as conflicting reports have emerged on how much or how little writers can expect to make. Our contention is that many of these reports are flawed, both by the self-selected surveys they employ, the sources for these surveys, and, occasionally, the biases in their interpretation. Our fear is that authors are selling themselves short and making poor decisions based on poor data. That is the main purpose for fighting for earnings transparency: helping aspiring writers choose the path that’s best for them. I pointed out to Howey that his own survey on the Author Earnings site is self-selecting, itself. His response is that the key is full and transparent disclosure, not only of questions asked in a survey but also of a survey’s nature and of the responses coming in. “I think surveys are great,” Howey said. “Presenting them as a whole picture is dangerous, especially if the source is limited both in audience and in time. Our survey will stay open. Anyone can see the questions. We can add to it over time based on feedback. The full data is available to all. Most recently, the self-selecting-sampled survey produced by Digital Book World (DBW) and Writer’s Digest has come under fire from Howey and others for what they say is an incorrect way of comparing self-published and traditionally published authors’ earnings. That controversy is extensively covered in Writing on the Ether: Where Publishing Surveys Cannot Go. Results of that survey have now been packaged by DBW under the title What Advantages Do Traditional Publishers Offer Authors? To pressure publishers to more fairly distribute a new and lucrative source of income. Operating in lockstep in offering authors only 25% of net is not just unfair but unsustainable, as more and more authors are going to jump to self-publishing. I’ve asked Howey if, in fact, he thinks that an author-advocacy effort like Author Earnings could have been mounted before the substantial rise we see today of the entrepreneurial-author dynamic, which is so focused on community and, in many instances, on mutual support. In other words, could this have happened when traditional publishing was the only game in town? “No,” he says. “Publishers refuse to compete with one another. They operate in lockstep in a way that seems to violate both good business sense and antitrust laws. “Self-publishing,” Howey says, “is a new and viable alternative, and so now we have real competition. “And let me be clear,” he adds, his own background as a yacht captain showing in his choice of metaphor, “the people in publishing are great people. I know quite a few of them, and they agree that these changes need to happen. But at the very top, you have skippers who don’t want to turn these boats. Howey, of course, is the author of the Wool “Silo Saga” trilogy and the new Sand—here is my report for The Bookseller on his new contract with Random House UK’s Century imprint for both the print and digital publication of the new book in the UK. He is already is seen by some as perhaps the most visible and outspoken of the high-earning pantheon of bestselling independent authors. Howey, with more than 2 million copies of his books sold, has been making it clear for several weeks now, in a series of essays, that he is personally committed to addressing what he sees as an established industry’s tendencies to obfuscate the best career paths for authors. Some will not be surprised at this formalization of his interests. I stand for the ability of those who choose to write for a living to have the best opportunities possible. It’s a narrow focus, but it’s one I’m passionate about. I’ve been passionate about this for longer than I’ve been writing. It goes back to my book review and bookstore employee days. As a reader who loved stories, I cared for those who created them. Now that I’m on the other side and have become friends with storytellers, this cause is strengthened. And the more I learn about the abuses authors suffer, the more I want to speak out. A fast-maturing level of discourse on the entrepreneurial author movement has been met—in some cases, not in all—by a more prudent, pragmatic, mutually respectful tone of dialog than marked the wider writing community even a year ago. And this widening conversation is being matched by a new rise in author-facing conference events, some of which frankly echo the sense of unrest and purpose being found in a newly coordinating author corps. Authoright’s inaugural London Author Fair, set for February 28, for example, includes in its branding graphics a fist with a quill pen in the style reminiscent of WPA-ear artwork, and the legend: Writers Unite. Howey, himself, is a speaker on the roster for the London Book Fair’s Publishing for Digital Minds Conference, April 7 at the Queen Elizabeth II Conference Centre in Westminster. London Book Fair also presents an Author HQ program sponsored by Amazon Kindle Direct Publishing and its London Book and Screen Week events culminate in a London Writers Fair on April 11. The new PubSmart Conference in Charleston , April 16-18, has Howey and longtime international publishing commentator Jane Friedman (host of the this site, JaneFriedman.com) as its keynote speakers. Howey is also a presenter at Klopotek’s influential Publishers Forum 2014, which is scheduled to take place this year in Berlin on May 5 and 6. And Howey will be working side-by-side with some 155 of his fellow authors in the all-new uPublishU Author Hub at BookExpo America, May 29-31, headlining the space with his fellow independent bestsellers Bella Andre, Barbara Freethy, and CJ Lyons. Howey says he’s ready for what will inevitably be considerable push-back from some in response to the Author Earnings material. We expect many to disagree with our analysis. We expect flaws will be found in our reasoning and our sampling methodologies. Discovering those flaws will lead to better data, and we look forward to that process. So, as we watch Author Earnings roll out, and that schedule of appearances looming, I ask him if he isn’t worried that his author-advocacy work is going to eat into his writing time and career. As usual, Howey is ready with a good answer. “My writing allowed me to quit my day job,” he says. “My new day job is geeking out over all things publishing, advocating for writers, connecting with readers. 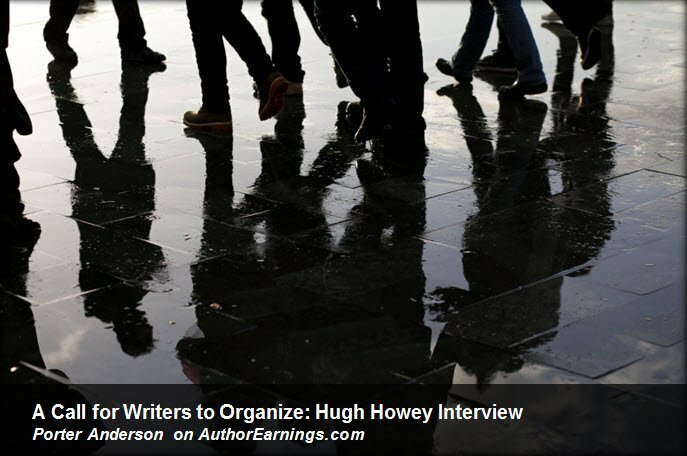 Data junkies: Author @hughhowey breaks down earnings for authors, publishers here: http://t.co/PEbgYOVeap Fantastic report. Posted in Writing on the Ether and tagged Amazon, author earnings, petition, self-publishing, survey. This data would suggest that, for these book genres at least, eBook sales have soared or traditional published books in this market segment have caved. Both seem hard to imagine, given the time burdens on readers and publishers revenue reporting. I’d love to see an independent analysis of the data and what it might mean. We live in exciting times, Porter. It’s a Wild West of publishing. Everything changes so fast, and it’s great that figures like Hugh Howey inspire more timid authors to be pro-active, to be in charge of their career. I’m looking forward to attend #LAF14 and see you soon in London. Yep, you’re right, and it’s a special event, really, when somebody is able to help a lot of folks in such a diverse community come together for “organized advocacy” of each other’s interests, as the Author Earnings site puts it. Looking forward to seeing you in London, indeed, keep that brolly handy, lol. These are numbers that have been out there for some time, and many of us suspected were as they appear, but were exceedingly hard to pick out and verify, as stated in the report. As time flows and more reports are generated, we’ll have a better, more generalized picture of the industry. Put these types of reports from Amazon and B&N and possibly Kobo, together with paper numbers from BookStats and others and I think people will see a truly amazing panorama. Readers are fully capable of being their own gatekeepers. Books are only following what’s already happened in music. I don’t think anyone thinks the data presented in Author Earnings is perfect, but it’s more than authors/potential authors get from Traditional Publishing. I have to admit that at first Hugh alienated me a bit because of his relentless self-promotion, but I’ve come to respect him for his equally relentless commitment to transparency. Publishing is changing radically, and if the discovery issue is solved, I don’t really see the advantages of publishing traditionally. Yes, good point. I do know that foreign rights (at least according to my agent) are where people make a lot of money, so I’d be interested why he made that decision vs self-publishing. He may have written about it and I just missed it. And in it, you’ll find a link to his agent’s open letter explaining the move, too. He loves that team, and has always told me in interviews that if treated like a partner, he’s very interested in working with a publisher. At Random House UK (the Century imprint), he feels that’s how he’s welcomed. Which is very heartening. Data is power. It won’t tell the whole story, but it will put you in a better position to make better decisions [ http://bit.ly/making-better-decisions ] about your business as an author. I may look ridiculous right now, but I am standing alone, at my desk, applauding at the transparency offered here. It’s a huge step forward, THANK YOU. Porter, as always I appreciate your take on all of this. Big happenings! I look forward to following this and learning more as additional data becomes available. Thank you for this informative, important information. I’m a new Canadian author currently working with a small US publisher, but am very seriously considering self-pubbing future works, or going the hybrid route. With a background in commissioned sales and marketing, I can understand the need for this type of grass-roots movement and support. I’ll definitely be checking this out further. Anything in the works for Canadian authors yet? If so, where? Thank you. Hi, Debbie, and thanks for your comment! I’d like to recommend you be in touch with the folks at Beyond Paper Editing http://beyondpaperediting/blogspot.com — Carla Douglas and Corinna MacLeod there are Canadian and are very attuned to these developing movements in the entrepreneurial-author community. They can guide you on what’s happening on the Canadian side of this fast evolution and they’re great people, really professional in their approach and guidance. Hope that helps! Many thanks for it and for reading the Ether. There’s a more recent look at these developments here — http://ow.ly/tEc6M — if you’re interested. And do join us Tuesday at PublishingPerspectives.com for more updates and commentary on the situation.